To celebrate International Facilitation Week 2013, we have brought together a collection of hints and tips (articles, presentations and video posts) about the practice of facilitation and the crucial role that facilitators play. The inaugural event, which runs 21-27 October, is an attempt to showcase the benefits of facilitation and the skills of facilitators on a global scale. Could You Benefit From More Effective Meeting Facilitation? Our free advice library offers useful presentation tips in a variety of key areas with a range of unique documents available to download. 'Powerful Questions for Facilitators', the Expert Guide, seeks to define facilitation by outlining what facilitators do and don’t do. Inside, you'll discover how to focus on core issues and communicate better as a team. Persuading people to your point of view more easily, your business meetings will be made more effective and your projects stand a better chance of being delivered on-time and within-budget. Facilitation is all about making it easy for groups of people to understand each other’s point of view. It’s worthwhile knowing what good and bad facilitators do. That way, a) if you’re called on to facilitate a meeting you’ll know what to do and b) if you’re participating in a meeting that’s being facilitated by someone else you’ll be able to spot if they stray off course and lend a helping hand in getting the meeting back onto an even keel. Visioning is a participative approach to goal setting. Having participants put forward ideas allows them to be a part of the action. An interactive investment is made by each individual. This process tool is only really effective, therefore, if you hear from every voice in the room. The alignment of views can create a good level of energy and allows the group to reach a shared vision. Every participant should be clear about the desired outcomes of the meeting. Sequential questioning is an assessment exercise that can uncover potential issues and conflicts in a snapshot. This process tool can be particularly illuminating at the start of a meeting or workshop. Typically the facilitator will ask a series of closed questions (requiring a ‘yes’ or ‘no’ answer) and ask for a brief description as to why. It is a good way to draw out honesty and discover what participants feel. Brainstorming is perhaps the most common way to generate ideas in a group environment. Providing some ground rules can be useful in terms of setting participants at ease. Clarifying that there are no bad ideas, for example, may coax a voice that would have been otherwise unheard. Brainstorming is an effective process tool because there is little evaluation or scrutiny of suggestions, that comes later. Brainstorming, in the first instance, is all about the accumulation of potential ideas. Facilitative Listening is about ensuring that participants are properly listening to each other. This process tool is most powerful when conflict arises. Facilitative listening ensures that each side gets a fair and equal hearing. When participants feel that they are being heard, tension is relieved and the likelihood of compromise is increased. Multi-Voting is a tool that allows you to quickly rank ideas based on priority. In a group setting, multi-voting is an easy way to establish what participants feel is most important. It is participative and democratic so there is usually little conflict. It only works, however, if you a) clarify what will be prioritised b) clearly set the voting criteria, and c) choose an efficient method, for example, a show of hands or sticker dots. Force-Field Analysis is an in-depth look at the pros and cons of any given situation. It is most useful as a process tool when all possible angles need to be scrutinised and evaluated. Force-field analysis allows participants to raise issues and identify potential problems with proposed solutions or goal statements. 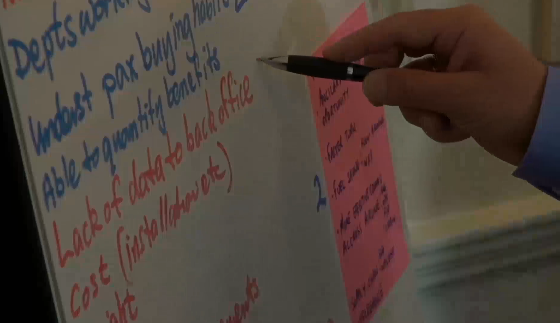 It is good, for example, on a flip-chart to note down what might help and hinder the achievement of the group goal. If you are aware of potential problems and deficiencies, you can best allow for them in any plan. Root-Cause Analysis is a way to unpick the underlying causes of a problem. It encourages participants to go beyond ‘this has happened’ and helps them to better understand ‘why this has happened’. This process tool is most useful when a group seeks a final and complete solution. Delving beneath the surface symptoms offers participants the chance to definitively solve problems. Decision Grids help to assess ideas based on set criteria. Essentially, a decision grid is a matrix that organises ideas based on how likely they are to be effective. This process tool is particularly useful when seeking to bring some order to a seemingly random or complex debate. Troubleshooting is a common way of identifying potential problems. Similar to force-field analysis, troubleshooting is a process tool that encourages participants to think ‘what could go wrong?’ and allows the factoring in of contingency plans. It is always better to prepare for setbacks and not be surprised by them. Wandering Flip Charts are a means of engaging a large group of people. This process tool is a good way exploring a vast quantity of issues in a relatively short space of time. Even better, it is a way to initially indicate and then organise what topics should be discussed and explored at a later date. It is interactive, as the name suggests and often sees multiple flip charts stationed around, or large sheets of paper pinned to the wall of a meeting room. Exit Surveys are a good way to take anonymous feedback from participants. They are a safe channel for participants who perhaps feel anxious about voicing key concerns in a group environment. As a process tool, exit surveys are a good way to collect snippets of data and decide upon areas for improvement. Survey Feedback is a more thorough method used to gather information from group participants. The results can often be a real catalyst for change, identifying clear action steps. Priority Setting is a tool used to refine ideas into action. 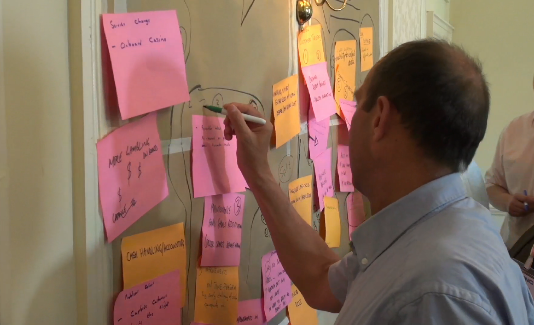 Big meetings can generate big ideas; flip charts packed with ideas and opportunities. How is all that theory translated into action? How do all those penned notes turn into a plan? Priority setting can kick start that process in an interactive, democratic way. Needs and Offers is a tool best used to ease conflict among participants. 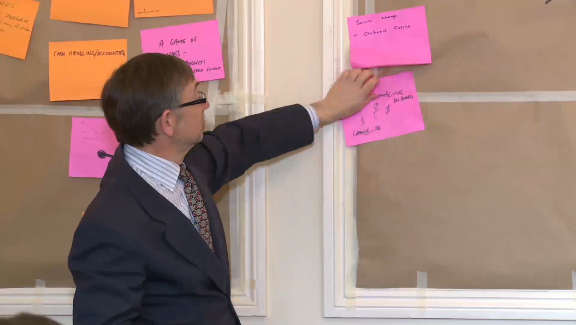 On a split flip chart, participants are required to state ‘I need this from you’ and ‘I offer this to you’. As the focus is on giving and receiving, there is little room for conflict to escalate. The resulting debate should be more balanced, productive and easy to manage. Systematic Problem Solving is a step-by-step approach that uses a combination of the facilitation process tools mentioned above. The systematic element introduces an element of participant responsibility along with designated roles and rights. If participants are involved in setting up the plan, they also bear responsibility to see that it is actioned.